Direct Sending, what does this mean? Basically by using the Direct Send mode in GroupMail you can send your newsletters directly from your PC to your recipients without having to use the external SMTP mail server of your ISP, web host or email provider. In a nutshell, GroupMail has it’s own internal SMTP engine which conforms fully to the latest SMTP RFC:5321. It will create a connection directly from your PC to your recipients mail server and send your message though it. What do I need to use GroupMail’s Direct Send mode? Direct Send is really for business use by companies with established domains, updated MX and rDNS records and a history of sending associated with their IP and email addresses. Even though it is technically not necessary, it is highly recommended that you obtain a static/fixed IP address from your Internet Provider and also have them create a reverse DNS record (rDNS / PTR) so that your static IP address points back to your domain name which you will be using as your sending email address. Why do I need a static IP address and rDNS record? Simply because the majority of recipient mail servers will reject a direct connection from any PC that falls into certain categories, namely – dynamic IP addresses which suggest that the message is being sent from a home Internet user or free internet user who may be sending spam. What SMTP port number do I use for Direct Sending? What if I really wan to use Direct Send but only have a dynamic/shared IP address? Some mail servers will accept your direct connection, but the vast majority will reject it. So you will probably notice a lot of failures. 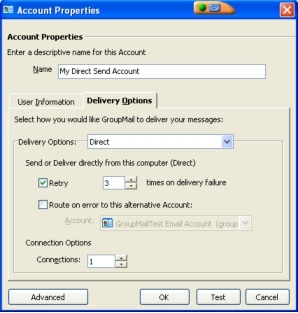 The good thing is that GroupMail allows you to configure Direct Send to retry on errors and to automatically reroute the message through an external SMTP mail server (via Standard Send mode) after several attempts. What other modes of sending can I use in GroupMail? 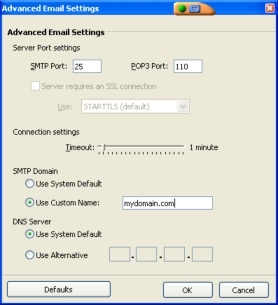 Standard Send mode is the most commonly used and recommended mode for sending as you will be sending through a valid and authenticated SMTP mail server. This way, you don’t need to spend your time worrying about static IP addresses, rDNS, MX records or other factors that might contribute to the success of message sent via Direct Send mode. Interested? Direct Send mode is available in both the GroupMail Personal and Business Editions.